Manchester City may be boosted by the returns of Sergio Aguero and Kevin De Bruyne against Everton, while John Stones will be assessed. 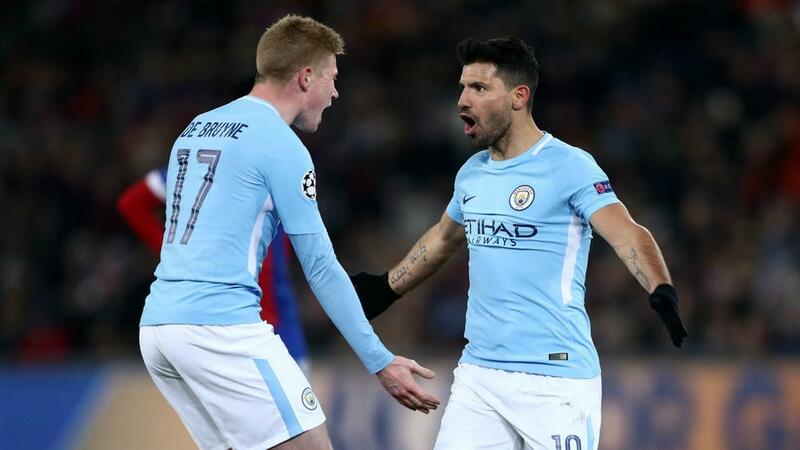 Sergio Aguero and Kevin De Bruyne could make their Manchester City returns when Everton visit the Etihad Stadium on Saturday. Aguero has not featured since City's 2-2 draw with Lyon last month, missing the past four matches in all competitions with an abductor problem. De Bruyne was named player of the year for the Premier League champions last season but has barely been involved this time around on account of two medial knee ligament injuries. Pep Guardiola's squad was stretched by a number of fitness issues ahead of Wednesday's 2-1 Champions League win over Hoffenheim but he told a news conference to preview the Everton match that two of his star men might be ready to return. "After we are going to decide. Kevin is the same case as Sergio. Yesterday he trained, he trained quite well. We will see." Key midfielders David Silva and Fernandinho sat out the Hoffenheim match, with full-backs Benjamin Mendy and Danilo also sidelined. The latter's absence in midweek saw John Stones deployed at full-back but the England defender made way at half-time with a knee complaint, meaning he is a doubt to face his former club. "Yesterday he was in treatment, today he is training," Guardiola explained. "We will see how they feel because when you have just 60 hours of recovery [it is difficult]. We will see." This cluster of injury concerns at a busy time of the season will not be enough, however, to persuade Guardiola to stray from his previously stated intentions for the January transfer window. "No, no, no. We are not going to sign anyone," he insisted. City are back in Premier League action for the first time since Chelsea handed them the maiden defeat of their title defence last weekend. "Last season one of the secrets was that, after we dropped points, immediately we were able to make another big run winning games," Guardiola recalled. "Of course, it is important. We have to focus on what we have to do beat them. "The Christmas time is here. It is the toughest part of the season in terms of the opponents, results and so on. We must try to keep focused." Everton have emerged from their two previous trips to play City with 1-1 draws, with Guardiola's old Barcelona team-mate Ronald Koeman in charge of the Toffees on each occasion. De Bruyne and Aguero both had penalties saved in a 2016 stalemate, while Raheem Sterling cancelled out a Wayne Rooney opener for 10-man City last August. "Especially in the first one we played really good," Guardiola added. "In the second one there was an incredible red card for Kyle Walker. We were 1-0 down with 10 men for 65 minutes and we played an incredible second half. "We made good games against Ronald Koeman's teams but we dropped four points. Everton have changed completely their team in terms of players – Bernard, [Gylfi] Sigurdsson, Richarlison, [Lucas] Digne, Yerry Mina. "It is a top side, I am really impressed with how they played so far. It will be a tough, tough game after the Champions League."